You'll be £19.99 closer to your next £10.00 credit when you purchase Life in the Victorian Asylum. What's this? Life in the Victorian Asylum reconstructs the lost world of the nineteenth century public asylums. This fresh take on the history of mental health reveals why county asylums were built, the sort of people they housed and the treatments they received, as well as the enduring legacy of these remarkable institutions. Mark Stevens, the best-selling author of Broadmoor Revealed, is a professional archivist and expert on asylum records. In this book, he delves into Victorian mental health archives to recreate the experience of entering an asylum and being treated there, perhaps for a lifetime. As reviewed and featured on Lil's Vintage World, YouTube Vlog! As referenced in further reading part of Michelle Higgs article on lunatic asylum records. A very good introduction to the treatment of mental illness in the late nineteenth century. In 166 pages the author explains the system adopted by our Victorian ancestors for treatment and care of the mentally ill. He puts the reader in the position of a patient and explaining in the modern style of a ‘Handbook’ what happened from the moment of diagnosis and admission through the daily life in the asylum to eventual departure either cured or through death. The various roles of attendants and other members of staff are detailed as well as the layout of the institution and its deliberate siting in the countryside to give patients open air and the ability to work on the asylum’s farm which provided freshly grown food. Until recently the great asylums were places of fear and stigma for those. Mark’s book explains how surprisingly caring the system was. The large rather austere buildings were places of kindness and help unlike those other Victorian institutions, the workhouses whose role was the relief of the poor. We are fortunate that the Commissioners in Lunacy kept such detailed records of those in their charge and that many have survived. Records have survived of patients, include descriptions and even photographs as well as their medical records and treatment, which included employment where possible. The records are closed usually for 75 years. Case studies are included towards the end of the book and a very helpful bibliography demonstrates the sources that can be followed up. If you have ancestors who were admitted to a lunatic asylum in the middle to the end of the 19th century this book is will open your eyes! It is highly recommended. It will give you a great sense of what it must have been like and how well looked after the unfortunate patient was. It was better to be in an asylum than a workhouse the author suggests. A thoughtful and provoking book that provides a detailed account of Victorian Mental Health care It is also a part of a depressing story because it shows how little mental health care has advanced over the last hundred years or so. This is really a book that everyone should read. Every bit as engaging as his best-seller, 'Broadmoor Revealed', this book will provide a great deal of background interest for many family historians. 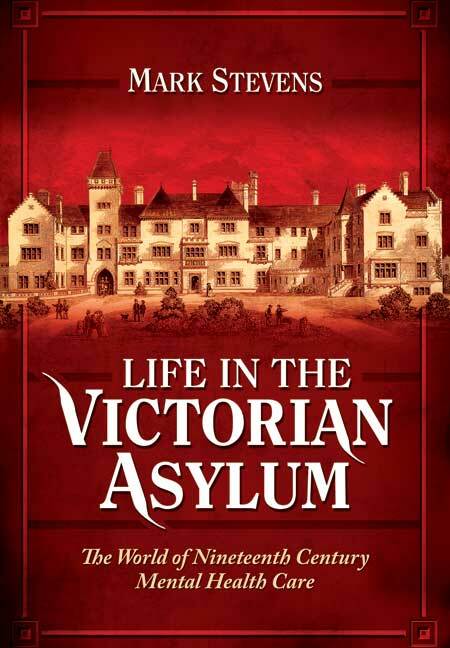 A comprehensive account of Victorian asylum life. The reader is invited to join a virtual tour of a typical nineteenth-century asylum where they are informed about the architecture, the daily routine, and the treatments offered. Stevens acknowledges the views of those who believe the asylum system was simply another instrument of poor law oppression, but at the same time, urges us to consider that the institution provided a better life for those suffering from mental health problems. Victorians will rejoice in the absorbing detail, acuity, and compassion of this book. This fresh take on the history of mental health reveals why county asylums were built, the sort of people they housed and the treatments they received, as well as the enduring legacy of these remarkable institutions. After his highly successful debut with 'Broadmoor Revealed', writer and archivist, Mark Stevens takes us into the forbidding world of the Victorian asylum...I thoroughly enjoyed this fascinating book. Stevens follows his book on Broadmoor with this more general overview of country asylums in the 19th century. It covers topics including the birth of the asylum, patient admissions, diagnosis, accommodation, daily routine and staffing. Stevens draws almost entirely on one asylum - Moulsford in Berkshire- but includes an incredible wealth of detail. This is wonderfully fascinating and useful background information for any genealogist. An illuminating book, taking the reader, as if we were the patient, through the doors of a typical institution of the period. As seen in the South Wales Guardian. Using examples from the archives, Mr Stevens brings the asylum back to life, with descriptive patients' views and a historically accurate presentation of 19th Century mental health. Reveals the often disturbing stories of thousands of patients and staff. As seen in The Mirror. As seen in the Herald Series. As seen in the Oxford Times. As seen in the Oxford Mail. As featured on BBC Radio Berkshire. Mark Stevens is Senior Archivist at Berkshire Record Office, responsible for looking after the Broadmoor Asylum archives.